By	Marios Alexandrou on October 21, 2018. Just 5 or 10 minutes away from the Mangrove Center where you can go kayaking is a butterfly farm. It's misnamed, as most butterfly farms are, because it isn't in the business of raising butterflies for release into the wild. Instead, the butterflies are raised simply to educate and, admittedly, entertain visitors. I've been to numerous butterfly farms as I can't resist taking pictures of these most beautiful of insects. 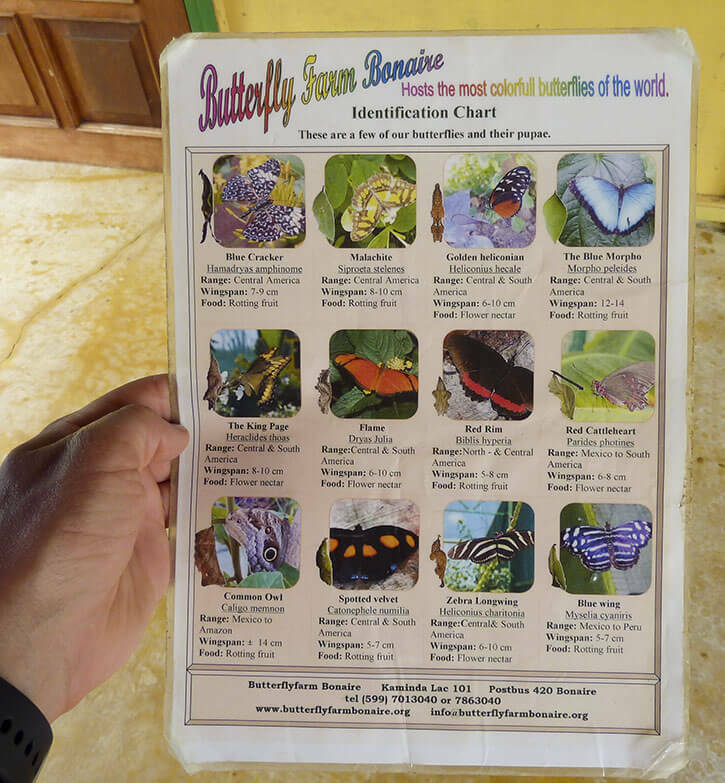 The Bonaire Butterfly Farm has recently undergone some changes with ownership. I don't know anything about the previous owner, but the new one does seem to be genuinely interested in butterflies. The gift shop has a lot of butterfly related items available for purchase including stamps from various countries featuring butterflies which I thought were pretty cool. Before paying admission, I asked what butterflies I could expect to see — the list was compelling enough (see below) that I was game. The owner was quite open about which butterflies he currently didn't have. The butterfly enclosure was well done with plants/flowers actually planted in the ground. This gave the enclosure a more authentic feel. There was even a fruit tree that was being used to feed the butterflies. The enclosure was big enough that it could handle a decent number of people, but when I went it was uncrowded, nor was there any hurry to get through it in a certain amount of time. The butterflies were numerous with the Blue Morpho being the most popular. It took a while, but I got photos of most of the butterflies. While the butterflies would eventually land on something to make a photograph possible, in many cases they wouldn't open their wings to reveal the colors and patterns that make for a great photo. Patience is key and I recommend making sure you leave enough time in your day's plan to get the shot you want.